Search My Ancestry: Ancestors' Advent Calendar: Dec 1st: Decorate Your Christmas Staircase With Evergreens! 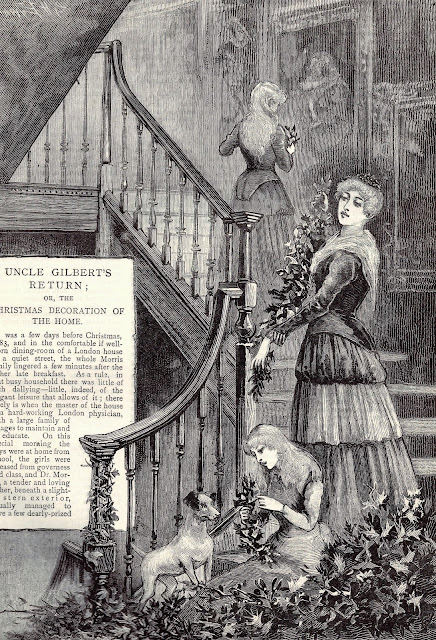 Ancestors' Advent Calendar: Dec 1st: Decorate Your Christmas Staircase With Evergreens!
' Hall and staircase decoration, rather than crowding evergreens into reception rooms, is a modern fashion. There is an air of welcome to a Christmas guest when he steps into a hall and mounts a staircase greeted by graceful festoons reaching from one corner of a cornice to another, ' Supplement to the Sheffield and Rotherham Independent, Saturday December 24th, 1881. How do you decorate your staircase for Christmas? Use the comments box. Don't forget to enter your email address in the box on the right for subsequent days in the Ancestors Advent Calendar and other articles.